Girl's Gone Child: This Sunday... Rock and Read! In the Hollywood area? Looking for something fun to do with (or without) the fam this Sunday? 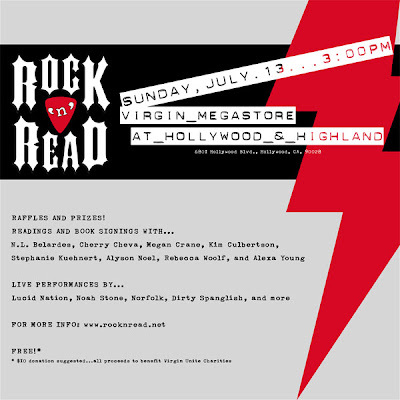 Come on down to the Virgin Megastore at Hollywood and Highland for some rock and read action (3:00pm-6:00) made possible by my lovely and talented friend, Alexa Young. You can check out the bands and authors (myself included) participating, here, as well as any and all information @ rocknread.net. ...And in other, waaaaaaaay less rock-n-roll news... I'm looking for birth-after-episiotomy advice o'er here. Your advice, opinions and stories are, as always, much appreciated.